Some cheap EU bashing | Oh. You here. Today I stumbled across this link, explaining the new plans for the Italian tax regulations. If a company wants to market stuff in Italy and uses ads and commercials for it, the company has to have a dependence in Italy where it pays taxes. The idea is simple: you want to sell stuff here, you have to pay taxes here. They aimed especially for the big players, google, starbucks, facebook who have their European representation in the Republic of Ireland for tax reasons. This summer the story made the rounds, that Starbucks pays taxes for the first time in 5 years in the UK. Starbucks just changed their accounting numbers legally so that all profit was taken from the UK and it looked like Starbucks had five consecutive years of losses in the UK while paying (cheaper) taxes in the Republic of Ireland for the money. And who fights for the citizens rights, who makes sure that not only the citizens pay the taxes, but also the global players? Right, not the European Union. They are now all like: “Nah, Italy, don’t do that. This is unfair, because companies can now only sell their products on your market when they actually are in your country. What if a small farmer from Brandenburg wants to sell his pickled cucumbers to your citizens? And wants to advertise it? Poor Horst can’t participate on your market.” And so the European Union announces trouble should the law pass the legislation process. That’s the good thing about the European Union. They make sure that we could trans-atlantic treaties with the U.S., that international companies don’t run into too much trouble when shifting money around the world and that all the useless politicians of the individual countries have a good outcome in Brussels and Strasbourg. Their idea of equal opportunities and rights results in companies pushing their goods into the neighbor’s markets, making it difficult for local producers. The whole European Union concept enables big players to do what they want with the small companies on the markets. Germany’s export surplus every year makes sure that there is no need for other companies to emerge and develop in the market areas. U.S. internet giants generate profits in every country but only pay taxes in a few. Protected by the European Union. Every try by local governments to act is stopped in Brussels (and Strasbourg every so often, another stupid thing in the EU concept) in the name of equality. 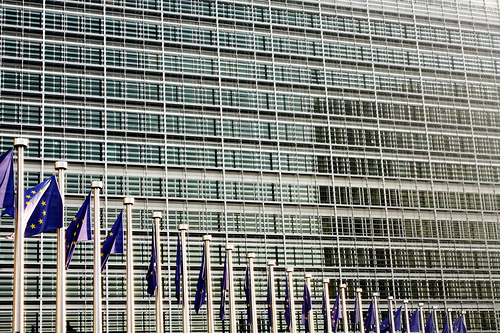 I once went to Brussels during school times and got introduced into the whole thing, I saw the monuments of glass and steel they built in the city centre, and I saw the vast complexes of translation offices, that take every single document, translate it into the 2 dozen languages of the EU and then print it out and put it on shelves to throw away after a month of no one picking it up. Back in the day I was convinced that the whole idea was a good one, that the people have the bigger profit and that the companies have a hard time to fulfil the EU regulations on toxic compounds, organic produce and production quality. Today I see the regulations on cucumber bending angles that are tolerated, the strict ban of conventional light bulbs in favour of toxic energy saving bulbs (a good idea that is poorly executed, as the manufacturers are not obligated to produce better bulbs. Most energy savers live not as long as conventional bulbs, but take more time to be produced and are dangerous when thrown in the regular garbage.) and now the interference with the attempts to stop large companies from drawing local money out of countries into the company’s pockets. This is a long rant. I don’t want to give the impression that all EU legislation is completely useless, but the whole concept of it has so many flaws that I wonder sometimes where the benefits for the people actually are. This whole thing wastes shitloads of money for travelling between two cities, for printing and translating every tiny document, for all the gigantic infrastructure. And in the end it’s not the sovereign who benefits but those who sell things to the sovereign. The governments blame all bad things on the EU while they use it to pass laws that are impossible to pass in the country itself. There is a lot of change needed before I can be happy about the EU again as I was somewhere in 2005.